Born on December 18th 1768 in Paris, France, Marie-Guillemine de Laville-Leroux is the first daughter of a politician and a housewife with an aristocratic lineage. Aged 13, she enrolls in one of Elisabeth Vigée-Lebrun’s ateliers. The private hotel Lubert, in the second district of Paris, hosts between 5 and 15 girls who are taught by the young woman. Mme Vigée-Lebrun is twice her age - 26 - and already one of the most famous portraitists of the capital. This apprenticeship leads Marie-Guillemine to exhibit for the first time at the Youth Salon aged 16, a portrait of her father (he will briefly be a minister in 1792, the last year of monarchy in France). In 1783, she’s 15 and confident enough in her painting to apply to the Royal Academy. At the time, there is a maximum of four female artists allowed at the academy. The positions being taken, her application is rejected. After the revolution, women will be forbidden at the academy. Marie-Guillemine enters the atelier of Jacques-Louis David with her younger sister Marie-Elisabeth in 1786. Her style becomes more defined, and her wish for historical paintings is aroused. Mythological scenes inspire her, as she can’t officially paint history. 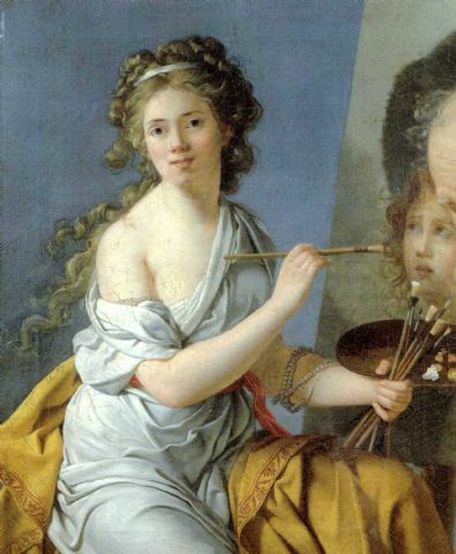 In 1791, she makes her big debut at the Salon with the painting Innocence between Virtue and Vice. Now that’s a meaningful title… As I see it, ‘Innocence and Virtue’ are young women and ‘Vice’ is a young man running towards them with his flashy red cape. It might help to know that traditionally, ‘Innocence’ was represented as a young man. In 1793, she meets Pierre-Vincent Benoist, a politician and a banker that she fancies enough to marry (fairly late for the time). His work requires frequent missions in far-away lands. Shortly after their marriage, he leaves for India. It’s a tumultuous time in France’s history, and Benoist is set to be arrested if he comes back to France. Jacques-Louis David is the one that signs the warrant. 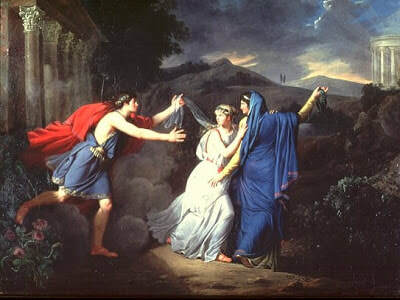 David is also famous for getting Adélaïde Labille-Guiard’s painting burnt - eventually causing her death. When her husband can come back to France in 1795, Marie-Guillemine Benoist can exhibit again at the Salon. During the following years, her career will grow significantly. Napoleon Bonaparte commissions a huge portrait in 1803, she receives an award from the government, is granted lodging at the Louvre. In 1804, she receives a gold medal at the Salon as well as a state allowance. It’s during this golden time that she paints her most famous portrait, in1800, six years after the abolition of slavery in France. The Portrait of a Negress (sorry for the politically incorrectness), now renamed Portrait of a Black Woman, raises many questions. The servant of her brother-in-law was officially free. 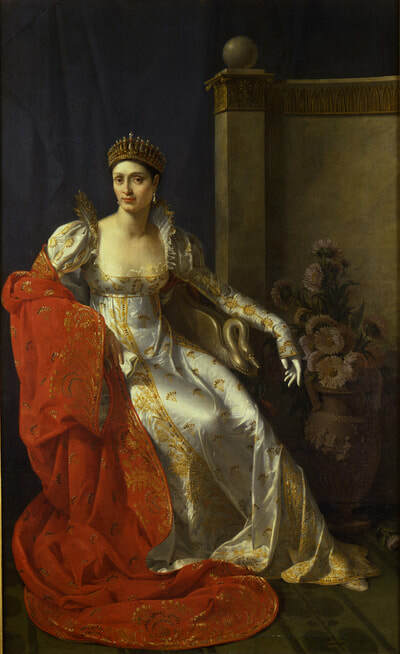 Did Benoist paint her to make her a part of an elite - as mostly the rich were portrayed? Or on the contrary, was it to show off her family’s ‘possession’? It has often been interpreted as a feminist icon. As we know too well, in the world hierarchy, the black woman has had the poorest rank (and still has in many places). Is it what Benoist is bringing to our attention? She is painting the former slave as she painted Elisa Bonaparte or as David painted Madame Récamier. 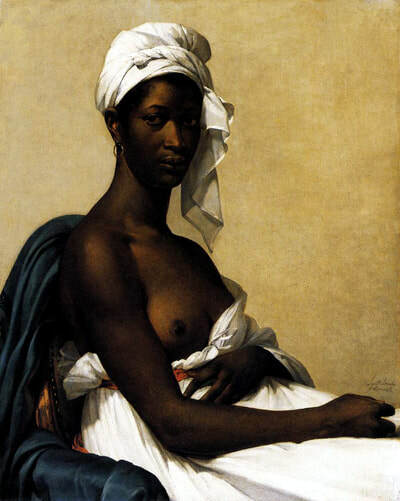 But again, the portrait could also take its root in the painter’s motivations: to prove her painting superiority regarding the treatment of flesh tones, or as an artistic research of the contrast between the dark skin and the light background. What is also in question is how we see the painting now. I like to see two women - one white and rich, the other black and poor - united in the creation of a breathtaking painting. The process of portraiture forces the sitter and the painter to be together for many hours… Were those silent hours? The Monarchy is restored in 1815, and Pierre-Vincent Benoist’s career booms. Marie- Guillemine has to retire from her career not to overshadow her husband’s. After he is appointed Council of State, the wife has to be at home to raise their daughter.